This book was for me, a lesson in patience. The main dietary ideas put forth I have found to be insightful and of real benefit to me physically. However, I found some of the philosophy and appendix material a bit discrediting at times (of course we all have our own opinions about what's credible). 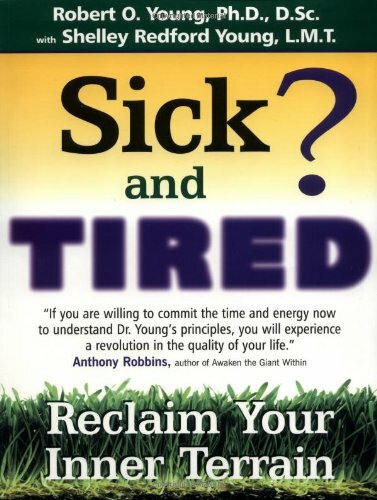 Some Very Good: Central to Dr. Young's approach to health is the philosophy that your inner terrain (i.e. the health of your cells) determines to the quality of your overall health. So, if you examine your blood and have acidic and parasitic constituents present, it is likely that you have a breeding ground for disease. I think this is an enlightened view, considering the cause of problems rather than just treating the symptoms of an already developed disease condition. His green-based alkalizing diet, and his justification for it, seem rational and well considered to me. I have lost weight, gained overall stamina and resisted colds and flu DRAMATICALLY, compared to my past history, and to my family (who are not on the plan)... and I am what anyone would call "a skeptic". The explanation of the pH balance of my blood and its effect on my body were compelling, and the tables and recipes made the application of the theory fairly easy. Some Not So Good: Just a few points about the book that at times, taxed my patience. I think that Dr. Young has solid scientific evidence indicating the effectiveness of his recommended diet plan, however he alludes to, at times, spiritual connections which I find distracting. Everyone has unique spiritual perspectives, so when Dr. Young alludes to his own in conjunction with the scientific material, I find it unnecessary and inappropriate. In an interview, Dr. Young indicated thoughts and music (acid rock) can be acid producing. I certainly think emotional stress contributes to disease, but music ? Music and emotion are linked by association, if Mozart were playing when some tragedy occurred in your life then it's more likely that it will be more of an emotional contributor to stress than Born to Be Wild... the type of music is irrelevant, and while this seems obvious to me, it puzzles me why so obvious a fact seemed to escape Dr. Young. The Case Studies are really patient testimonials, I would rather have prefered a larger number of cases with more scientific data. In the appendix material of the book, some of the "resource" material presented was of doubtful value in my opinion: Biomagnetics, Geopathic Stress (and professional dowsers of all things ! ), etc. OVERALL - I think the book is extremely valuable. If I had a family member with a serious illness I would be sure to put them on this diet, the material is that compelling. Of course Dr. Young's whole point is that if you live according to the plan, it will be comparatively unlikely that you will contract serious illness...he really makes a very compelling case. I would also add that Dr. Young comes across to me as a deeply caring and committed researcher, and not someone who 's primary interest is to sell me something for their own profit. I would be very interested in buying a follow on book by Dr. Young detailing (not in patient's testimonials, but scientifically), case studies.. with some successes (and even some failures). I recommend this book highly. Dr. Robert Young, is a scientist who passionately cares for his work concerning how foods positively and negatively affect the body.